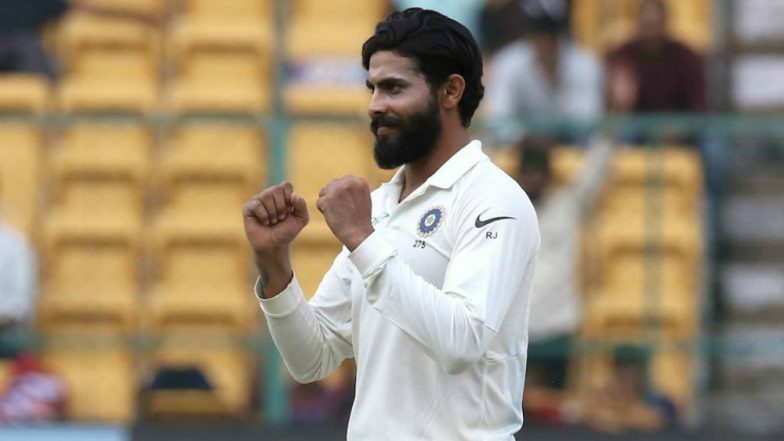 New Delhi, April 16: Ravindra Jadeja, an all-rounder of the Indian cricket team, on Monday extended support to the Bharatiya Janata Party (BJP) and Prime Minister Narendra Modi. Ravindra Jadeja backed the BJP a day after his sister and father joined the Congress. His wife had joined the BJP last month. Responding to Jadeja's support, PM Modi thanked and congratulated him for getting a place in India's World Cup 2019 squad. "I support BJP. @narendramodi #rivabajadeja jai hind," Jadeja posted on his official Twitter handle on Monday evening, tagging PM Narendra Modi and his wife Rivaba. Replying to Jadeja's tweet, PM Modi wrote: "Thank you @imjadeja! And, congratulations on being selected for the Indian cricket team for the 2019 World Cup. My best wishes." Jadeja was named in India’s 15-member squad for the ICC World Cup. On Sunday, Jadeja’s elder sister Naynaba Jadeja and father Aniruddhasinh formally joined the Congress at an event in Kalavad town in Jamnagar district. Speaking on joining the Congress, Naynaba said she wanted to work for women empowerment and chose the grand old party as it was fighting for rights of women, farmers, youths and others. Naynaba, who manages a restaurant run by her family in Rajkot city, is credited for taking care of the family and Jadeja’s cricketing aspirations after their mother died around 15-years-ago. Jadeja’s wife Rivaba had joined the BJP on the eve of Prime Minister Narendra Modi’s visit to Jamnagar on March 3.